Answers to the most frequently asked questions about learning UX Design It can be difficult for beginners or those just curious about UX Design to find out how or where to start learning. Most information about UX Design is disorganized, fragmented, or lacking in actual details. The UX Learner’s Guidebook ties it all together to provide a strong, comprehensive learning foundation by combining practical, clear examples with in-depth explanations on topics such as: • How to learn UX Design • How UX Design happens • UX methods and how to use them • What makes up UX Design competency • The different types of UX Design jobs • How to find and land a job in UX Design The UX Learner’s Guidebook goes well beyond common UX advice, touching on the need for research, diplomacy, management, collaboration, and self-reflection in addition to technical design skills. 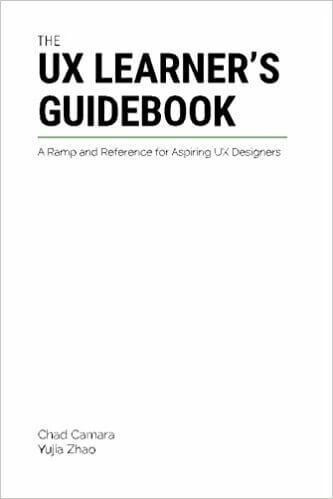 This book lays the groundwork for students and professionals to better understand what it takes to excel at UX Design, gain the confidence to start practicing right away, and continue growing and learning in their careers.